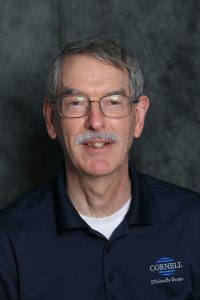 Steve Perry, PE is a Product Engineer with Cornell Pump who is retiring on March 28, 2019. He joined Cornell Pump 31 years ago and has seen the engineering department grow and change tremendously in three decades; from a group of five to over 20 engineers and drafts people. Perry has been involved in many of the new innovative products engineered by Cornell Pump, and has an encyclopedic knowledge of Cornell’s offerings. A fixture at Pump School for decades, Perry enjoys imparting hydraulic fluids knowledge to students and end-users. He consistently organized groups of young students to tour Cornell and learn about engineering opportunities. He will spend time watching is alma mater’s (Oregon State University) baseball team, hiking, folk dancing, and spending time with his wife. We wish Steve the best in his retirement. He will be missed!